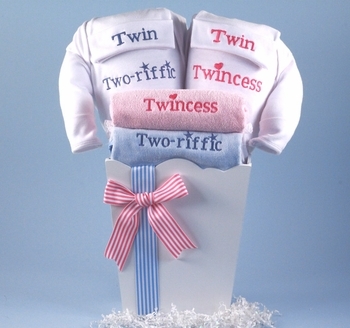 This is another one of our unique twins gift ideas when the duo consists of one boy and one girl! Should the expectant mother be looking forward to a girl and boy, these artfully designed outfits will be a welcome addition to their wardrobe. This darling set comes with coordinated and embroidered 100% cotton layette items all made in the USA of the finest cotton materials. The entire ensemble is artfully presented and wrapped in a painted wood bucket for use in the nursery. See More Images above for a close-up pictures of the embroidery.